The SumoBoy is designed to learn fundamentals of electronics and programming for pupils and enthusiasts. 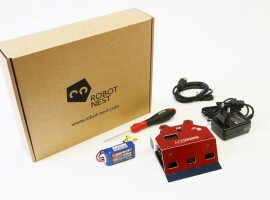 Its design is fully compliant with international robot SUMO competition rules and is ready to be compete. SumoBoy reflects experience and know-how of the Latvian robotics team, which has been among winners of European, USA and Japan robot competition for several years. The robots is controlled by well-known Arudino Micro microcontroller. Allowing to use huge knowledge of the Arudino community. The robot will be attractive for both beginners and experienced enthusiasts. Sensor num. 3 pcs. extendible to 5 pcs. Line sensor num. 3 pcs.